Tickets cost $20, but if you join the Pip’s Club (free membership), you can purchase tickets for $18! 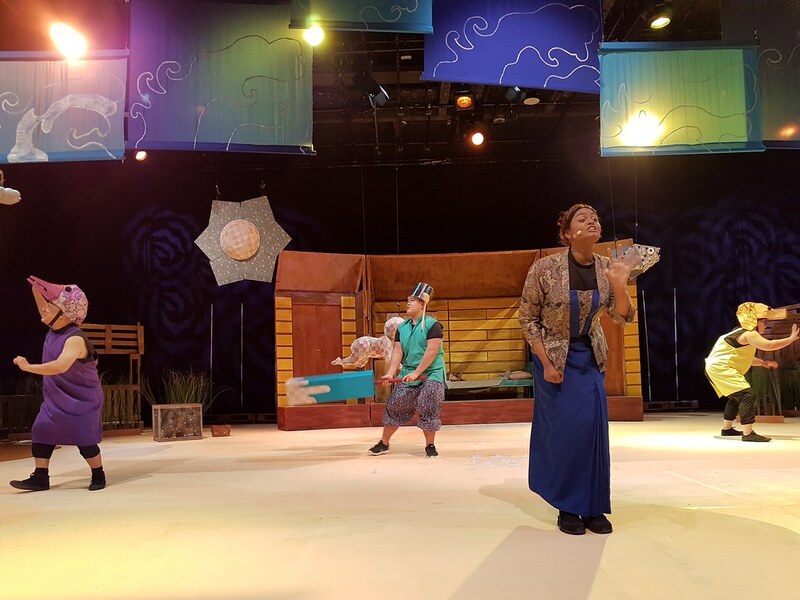 *** There are also sensory-friendly performances for children on the autism spectrum or with special needs. Koko is reminded by his mother not to venture beyond the river before she leaves for the market. Once he is alone, he imagines himself as Koko the Great and embarks on an adventure in the kampong and beyond. No prizes for guessing if he crosses the river! 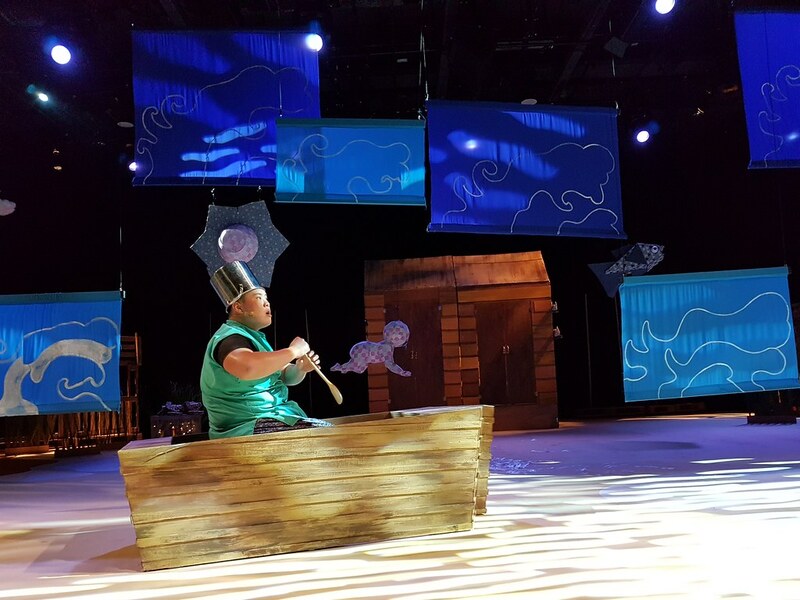 The story takes place in a kampong that comes to life with colours, friendly animal puppets, sing-alongs, dance-alongs, surprises and more. Adapted from the children’s book Koko the Great, written by Natalie Hennedige and illustrated by Twisstii. 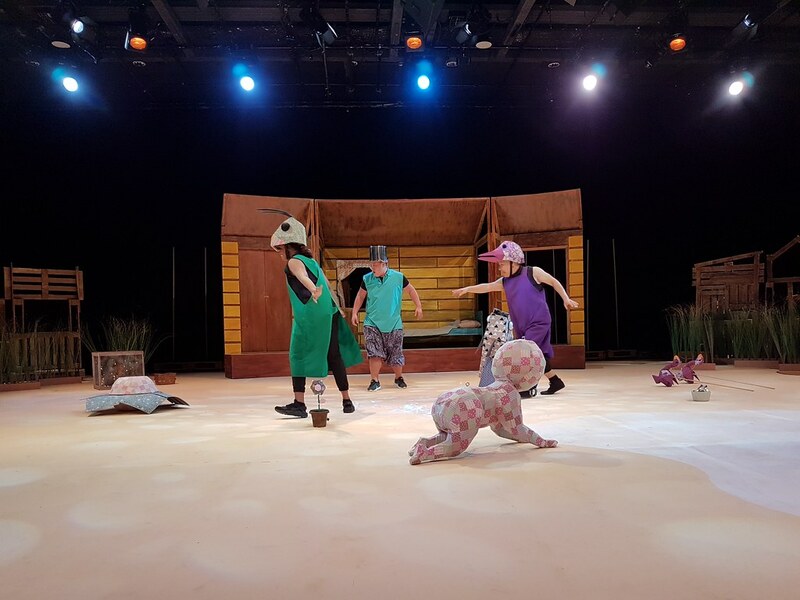 We were invited by Today Got Class and Esplanade Pip’s Club to the preview of Koko the Great, a theatre production held in conjunction with the Children’s Biennale organised by the National Gallery. It was Elise’s first time watching a theatrical production. 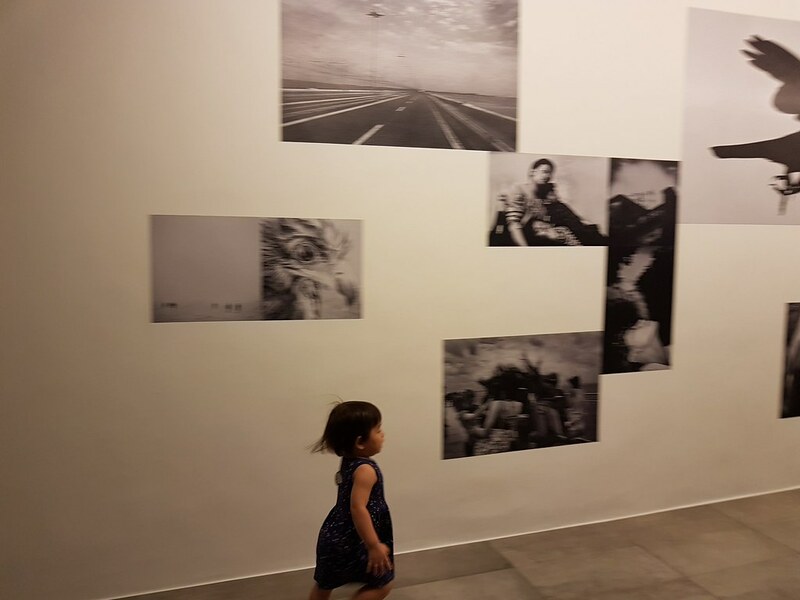 I wondered if it would be too abstract for her to understand but as we sat on the floor, she kept her gaze onto the set while I pointed out the items she knew (dog, duck, balls, tree, cloud, boat). 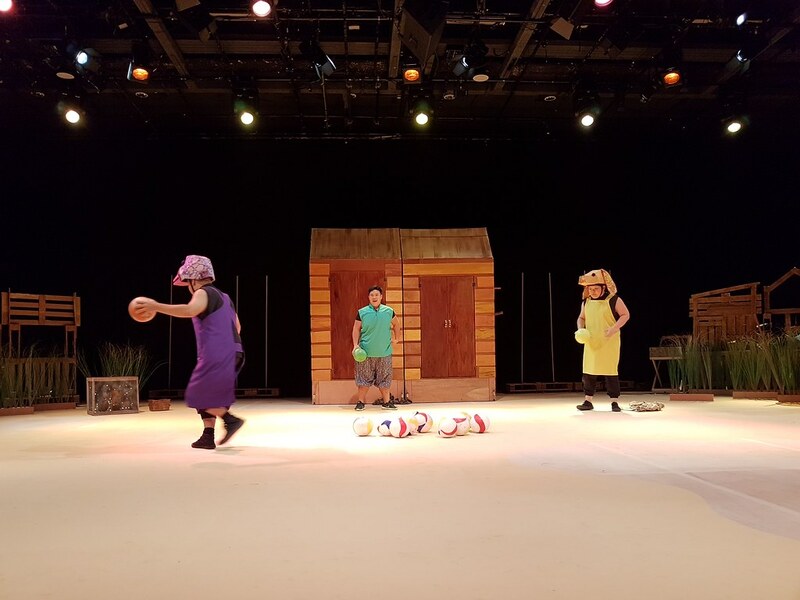 The 40-minute play was full of movement and sound. 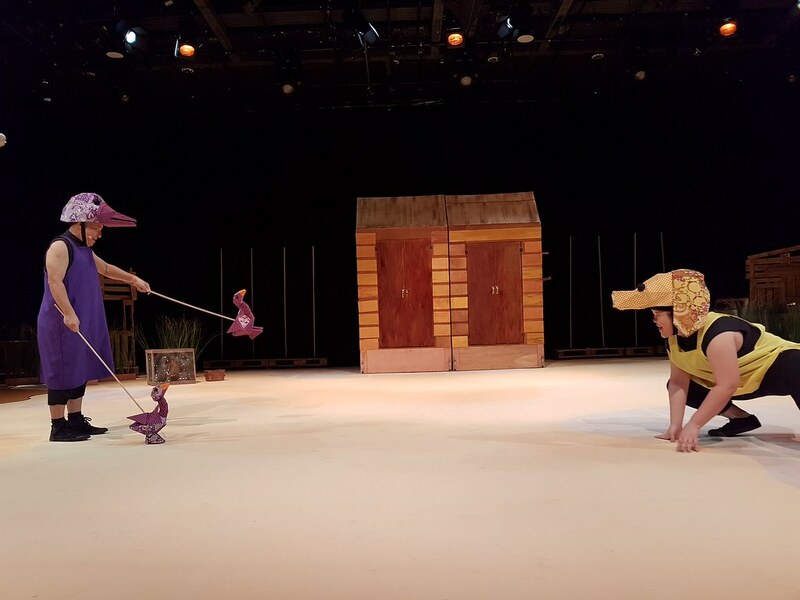 Patchwork props and puppets, singing and music brought the scenes to life. Koko dreams big; he imagines a small flower, tiny fish and an infant to be gigantic and enormous, to which the villagers mock. The audience is taught the movements to the song which they can follow along. Elise was a bit too young to catch all the moves. 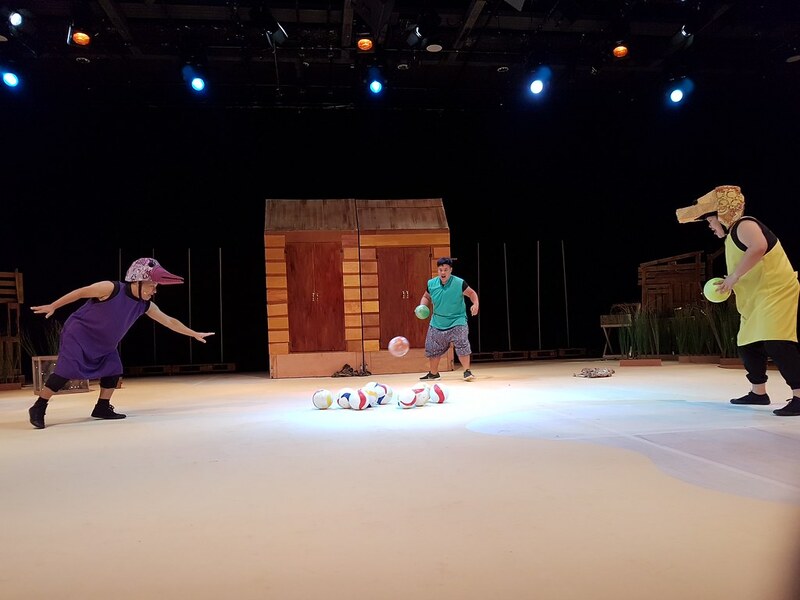 Before Koko embarks on his adventure, we’re shown how a typical morning in the kampong is like, with egg-laying hens, dogs and ducks taking baths and Koko the kampong boy, bored of the same old village routine. As soon as his mother goes out, off he goes! 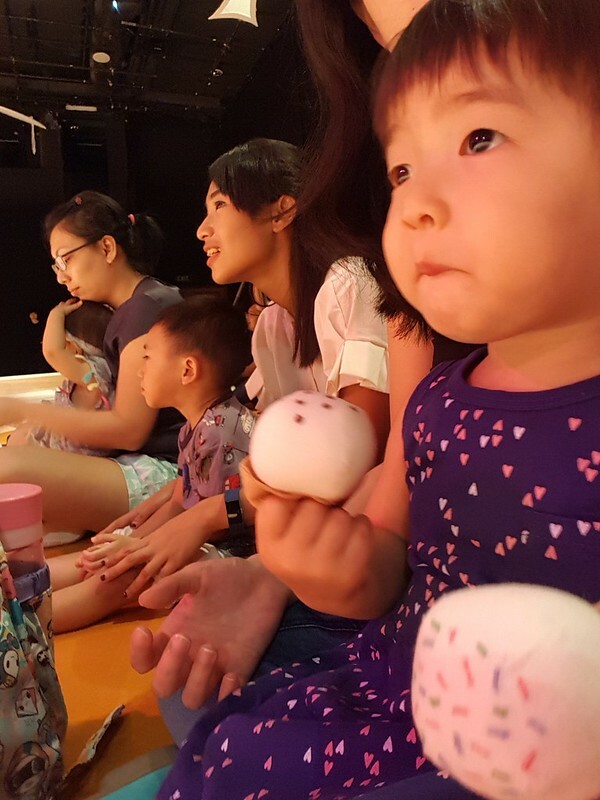 Probably knowing that children lose focus easily, there is a segment where the audience is invited to help Yellow Duck, Purple Dog and Koko sort out foam fish with patterns from the nets into baskets. It took a bit of prodding for Elise to go up and sort the fishes, but the rest of the children did so with ease. It seems that now she is a bit older, she’s developed some kind of wariness against strangers. 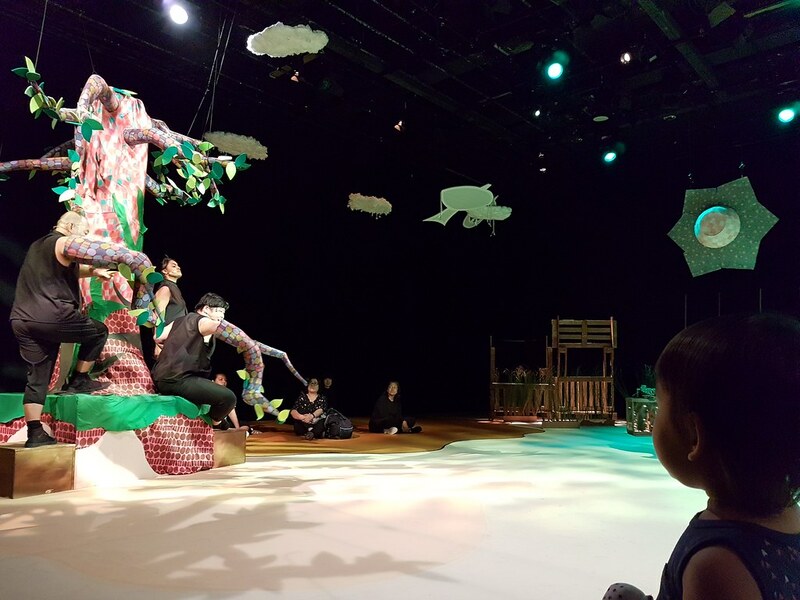 In this part of the play, Koko meets a menacing tree – the Green Giant, who warns him that he would not be able to go back home. The show ends with Koko’s mother returning and rewarding him with a giant popsicle. The story line is simple enough for children to follow without needing explanation from the adults. Watching the production from the floor, I couldn’t help but notice beads of perspiration forming on the actors’ faces. It must have been warm under the spotlight, but they put in their best efforts despite the heat. Local theatre is much underappreciated and I’m glad Elise was given the chance to watch art in a form she has not seen before. 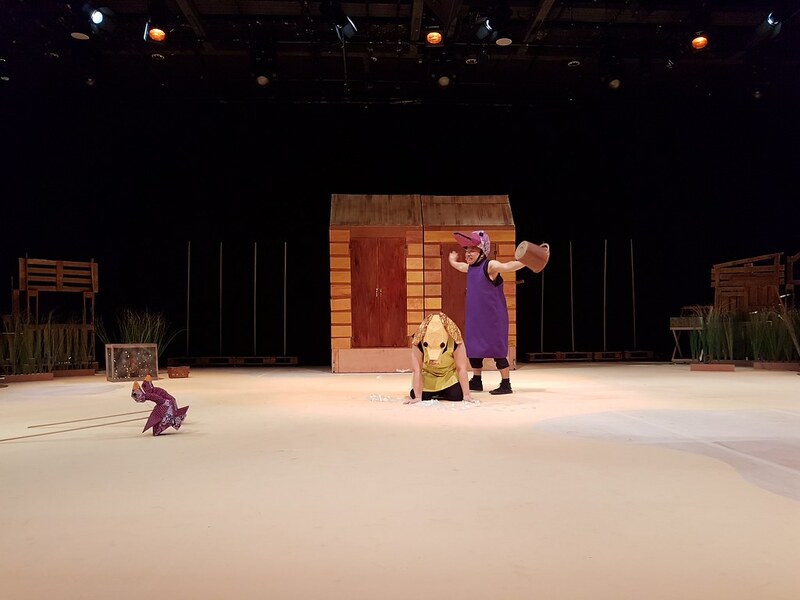 Children benefit from exposure to theatre arts as it stimulates their imagination – “that looks like a baby, why is it so large? Why doesn’t it have a face? Why is that man wearing a duck hat and acting like a duck?” which in turn makes them question and look for answers, much better than rote-learning and memorisation. I don’t usually pay much attention to theatre and art. At the museums, I prefer the interactive exhibits over abstract paintings. Hence, this theatre play was something new for the both of us. 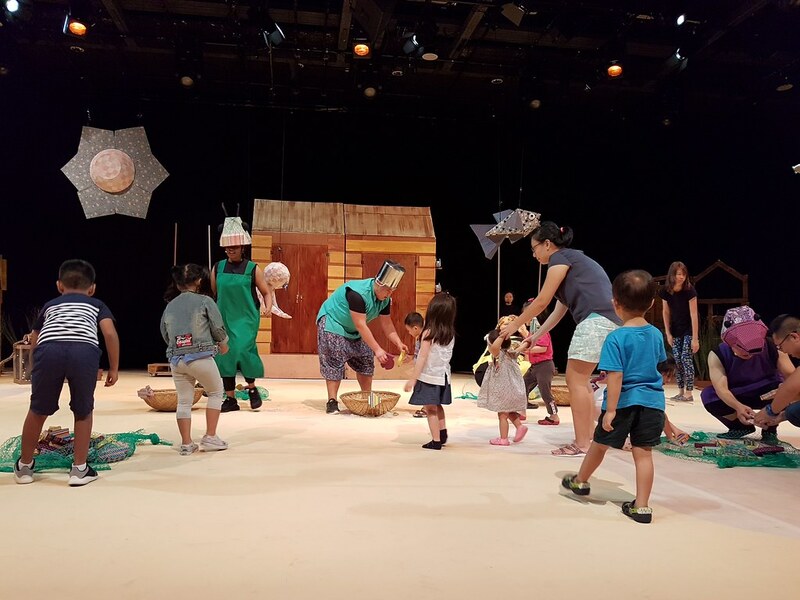 After the play ended, we grabbed some lunch and popped by Pip’s Playbox, a relatively quiet space for children to play safely (with free admission!). 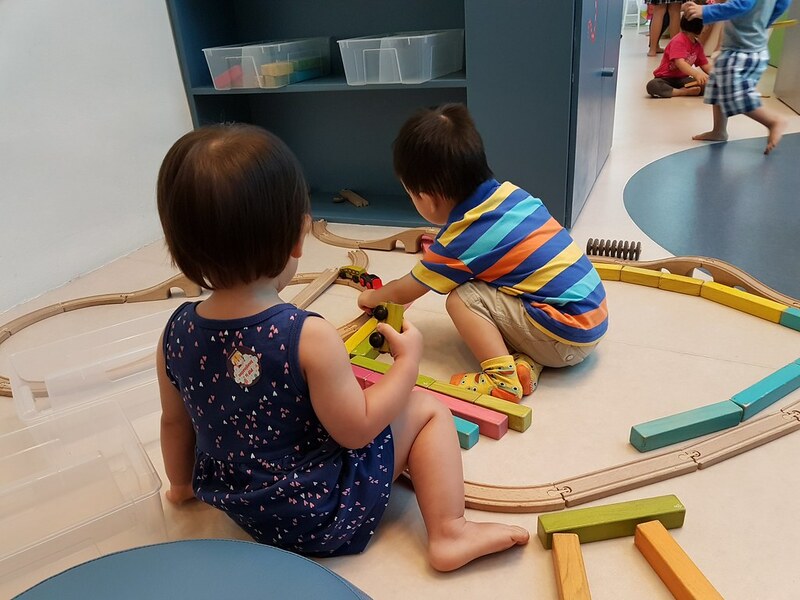 There are train tracks with trains, magnetic wooden building blocks, a two-storey house and nooks and crannies to chill with a book. There’s also a corner for arts and craft. The place is sanitised daily between 2 to 3pm. One thing I like about this place is that the toys stocked are open-ended and children can build whatever they want according to their creativity. 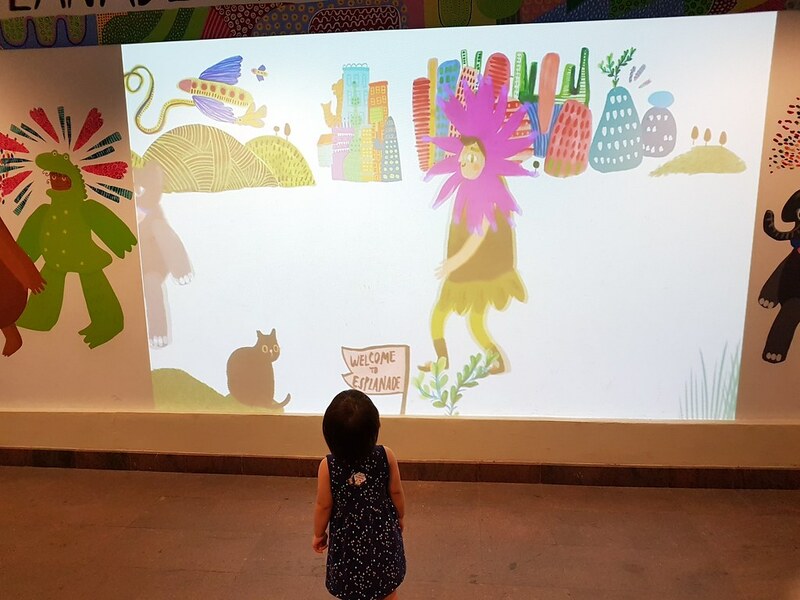 No electronic toys or screens but lots of hidey holes and cabinets which open up to reveal colourful murals. Over here, children have to take responsibility for keeping the toys back in their proper receptacles before leaving. The place opens till 6pm, but we left earlier to avoid the peak hour train rush. We’re making the most of the remaining time we have with Elise as the only kid, so despite my huge bump, I’m determined to bring her out as much as possible until didi comes in and steals the show. 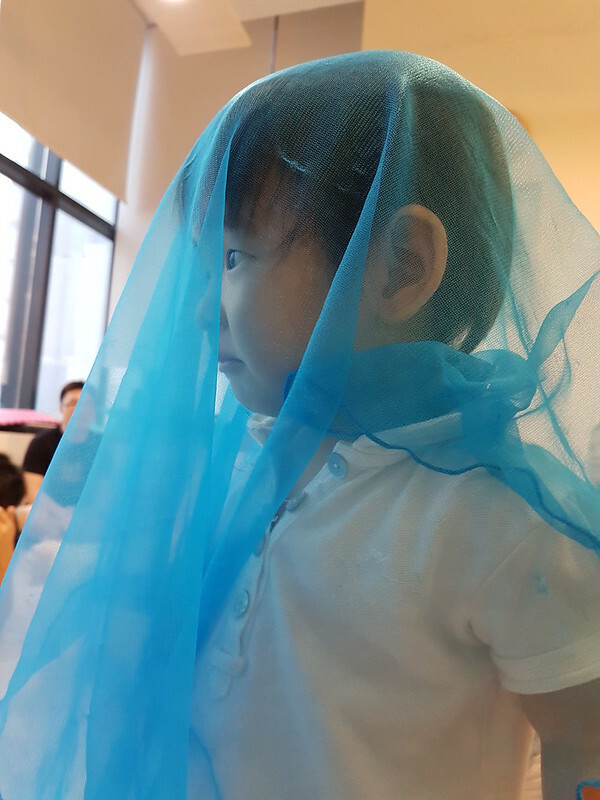 Elise has been attending about 5 lessons of Kindermusik so far. I had a hunch she’d like it. We missed Lesson #3 because I had an exam and my husband who promised to bring her ended up slacking at home not bringing her there. 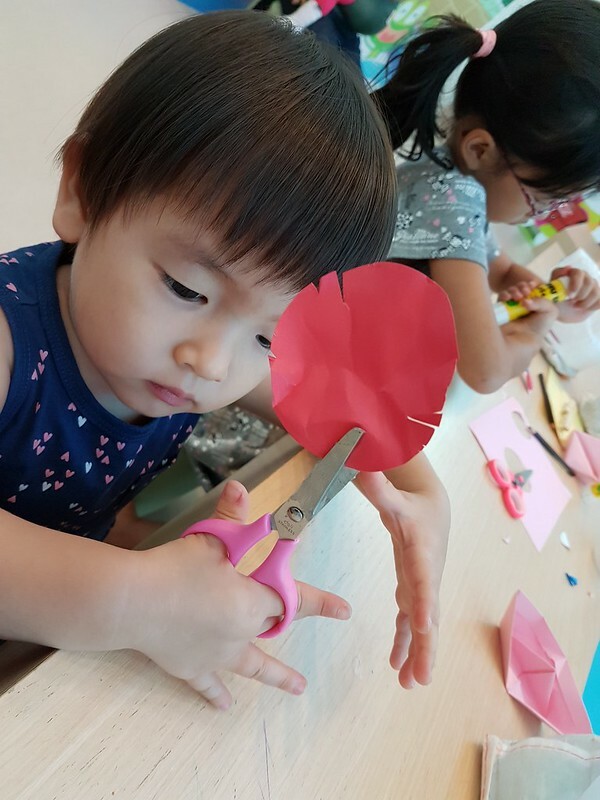 We’ll also be missing out on two upcoming lessons when we fly to Korea and it’s a pity because the curriculum runs concurrently for the classes, so while there are make-up classes available, they are only suitable if you can’t make it on the day itself. Each term (12 lessons) is split into 3 themes, 4 lessons per theme. 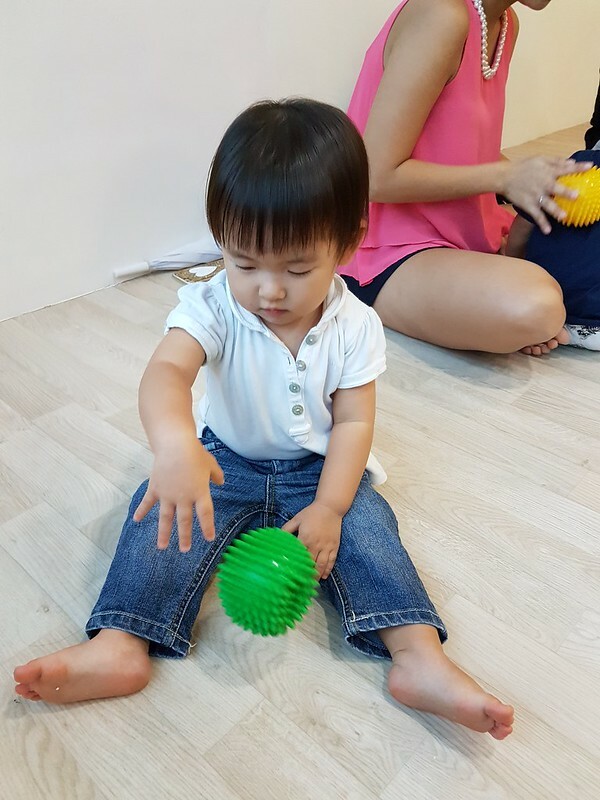 This was taken during the 3rd lesson of Playtime. 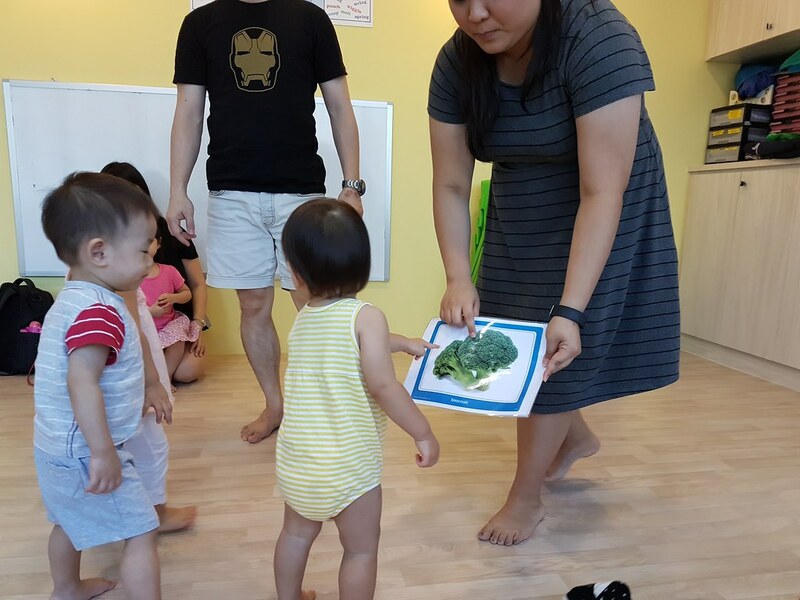 At the start of each concept, a take-home kit consisting of related materials will be given out for parents to continue the concepts at home. It usually includes an instrument, a board book and a CD. The songs sang in the lessons relate to the theme. There were songs like Pop! Goes the Weasel for Playtime. 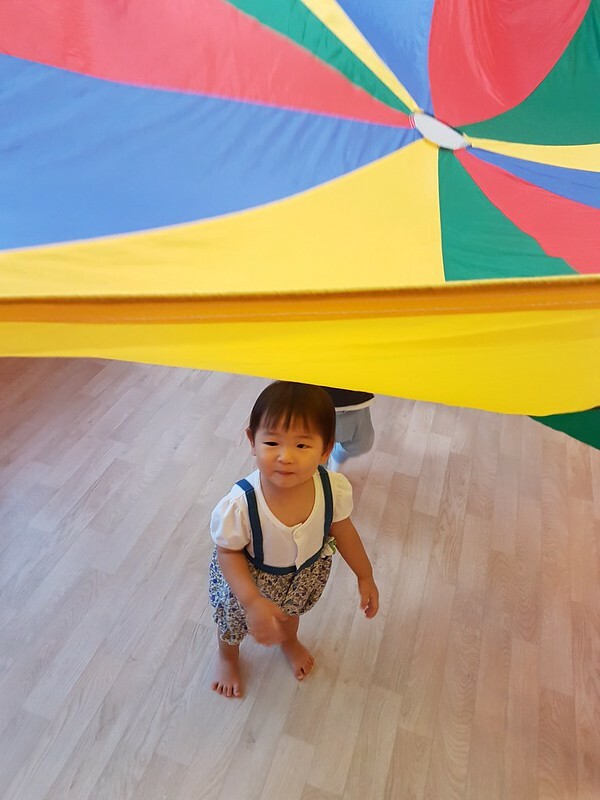 Elise under a rainbow parachute – part of “Playtime”. There is a structure to lessons. 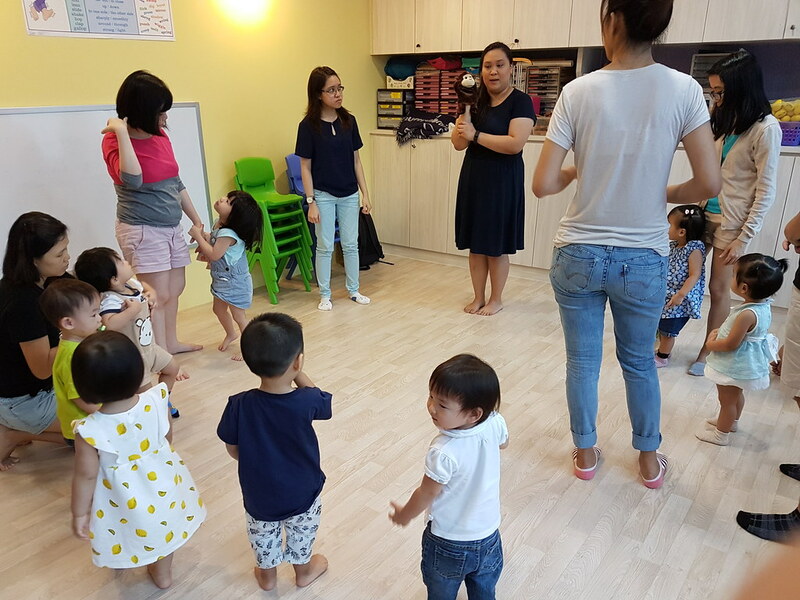 After singing the Hello song, there’s some circle time where we do some actions with the children to instill some concepts in them. For example, last week, they learnt about inhibitory control . Inhibitory control is simply the process which allows an individual to restrict their natural impulses or behaviour e.g. freezing on hearing the word “stop”. To emphasize this, they waved, rolled, clapped and waved their egg shakers to the music and stopped when the music stopped. Whenever a new toy or book is introduced, the children all rush up to the front for a closer look. 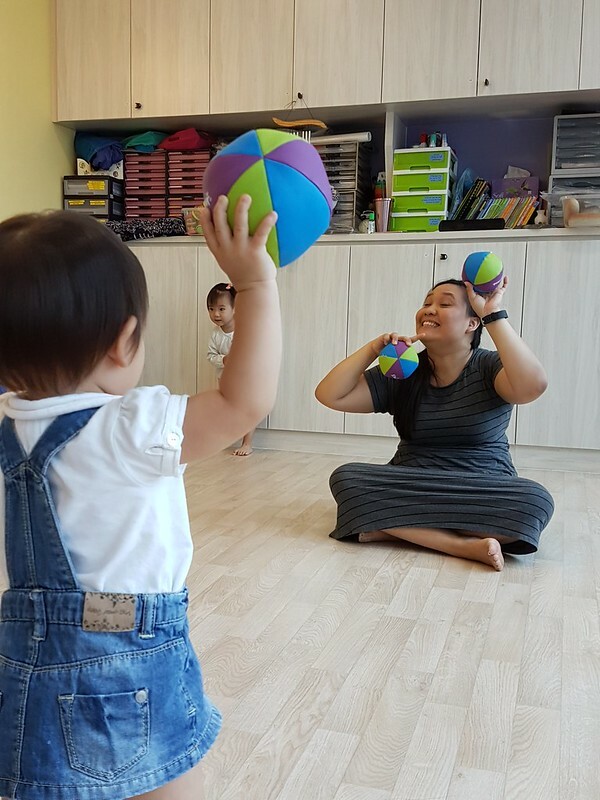 Sometimes, teacher Natasha hides the toy or box behind her for them to focus on the current object in her hand but they just go around her to hunt for it. It’s also interesting to observe that at this age, even though each segment is kept short in view of the limited attention span that children have, their natural impulses are still dominant (I do whatever I want to do) so you see kids lying down on the floor “swimming”, running about or hiding in corners during lesson time. For most part, they join in when there’s something new to see or do. A positive improvement I observed from Elise over the course of a few lessons is that while she used to be reluctant in returning the toys after the exercise was over (she would yell if I tried to pry it from her grip so she held on to it even after the next activity commenced), she now returns the toys, waves bye to them and claps. She was the only one who wouldn’t return the toys and now she’s still one of the last to return toys but it’s a visible difference. 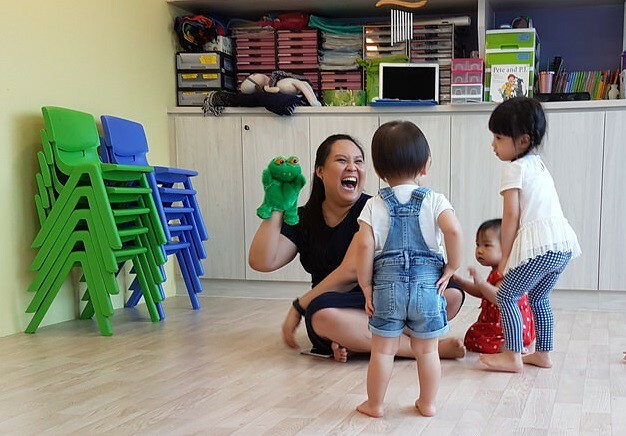 What I like about teacher Natasha is that she doesn’t use harsh voices on the children even when they don’t behave very well. Many times, they go right up to her face when she’s trying to read a book to the class but she entertains them. That’s not to say she’s a pushover as she controls them in different ways. 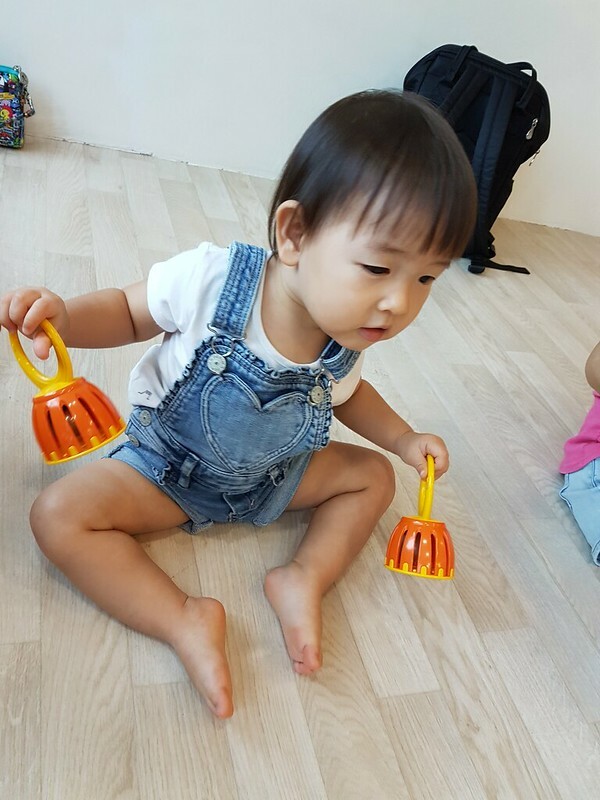 When handing out instruments for a new activity, she tells the children that they will only receive them if they sit down and bypasses those who are standing up, jumping to get her attention so they learn to follow instructions. 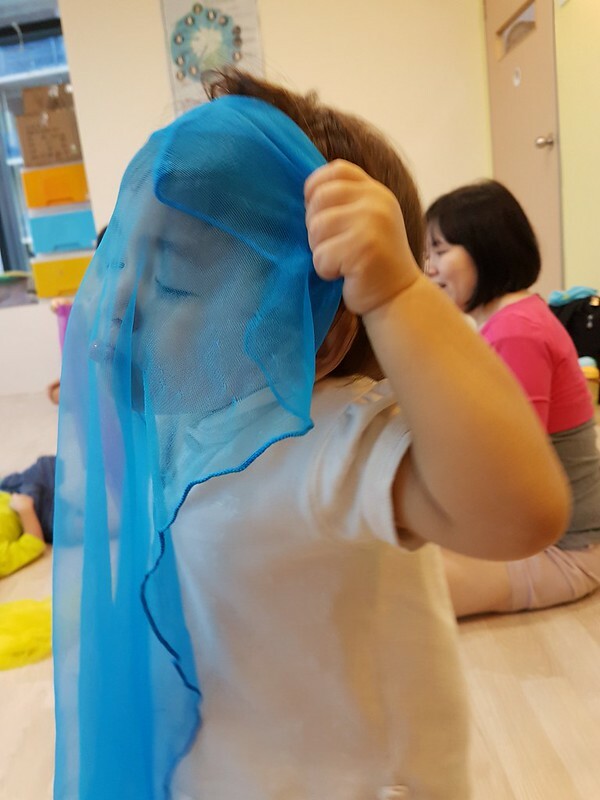 Children love scarves, veils and pieces of cloth where they can hide behind to play peek-a-boo. It helps with sensory exploration. We’re on the theme of Yum! 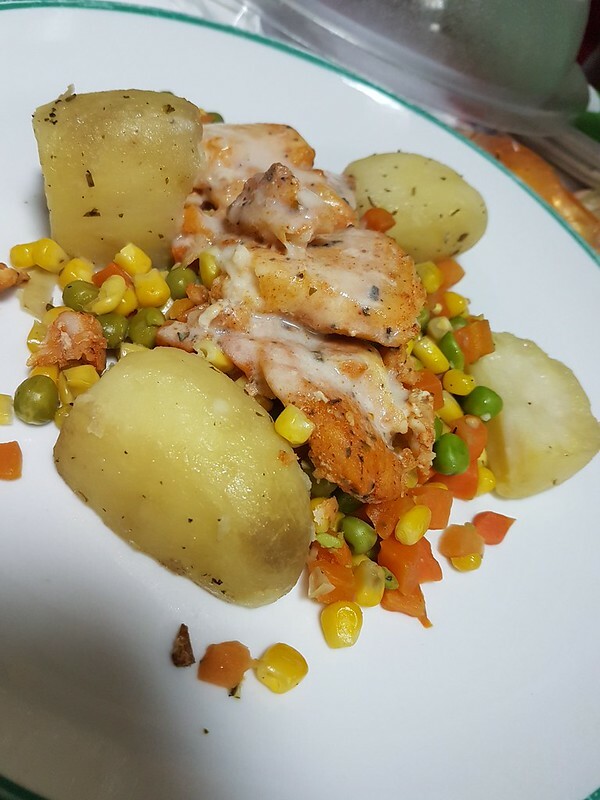 so the lessons revolve around food. 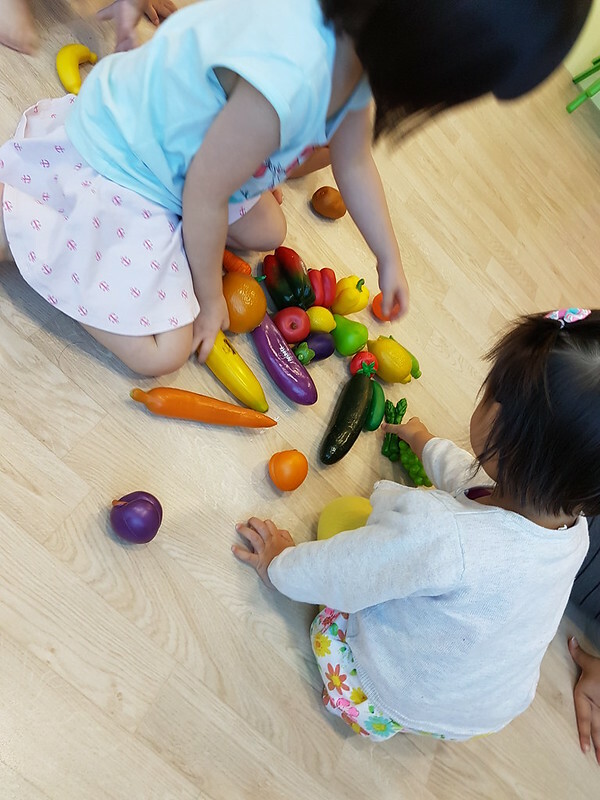 Flashcards with commonly seen vegetables were shown to the children, after which they got to choose their favourite vegetables to play with. These colourful plush balls with bells inside were used in place of “apples”. The children chose shakers resembling buns, croissants and bread. Elise tried biting into it but they were made of hard plastic. She also tried to feed me with it and almost knocked out my front teeth. 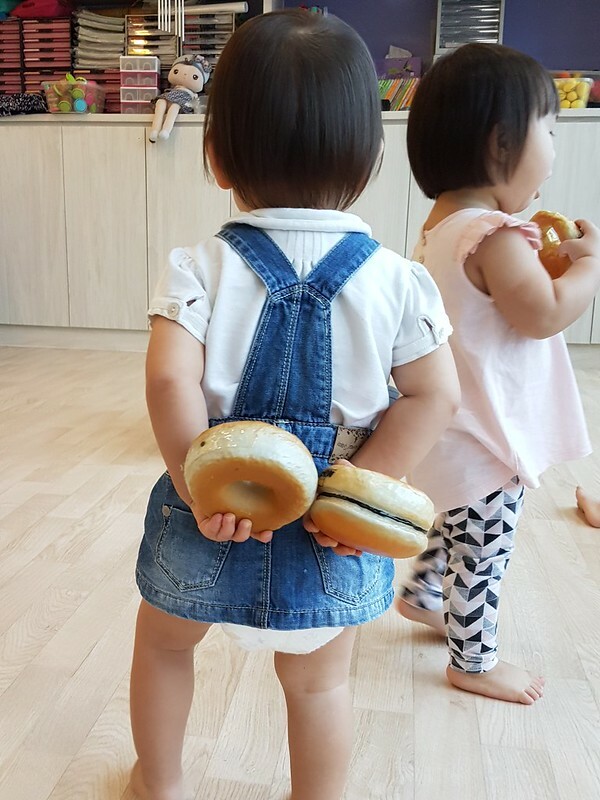 -_- Her friend in front is trying to get a bite of her croissant! My impression of the class so far has been positive as Elise has been proactively participating in the songs. 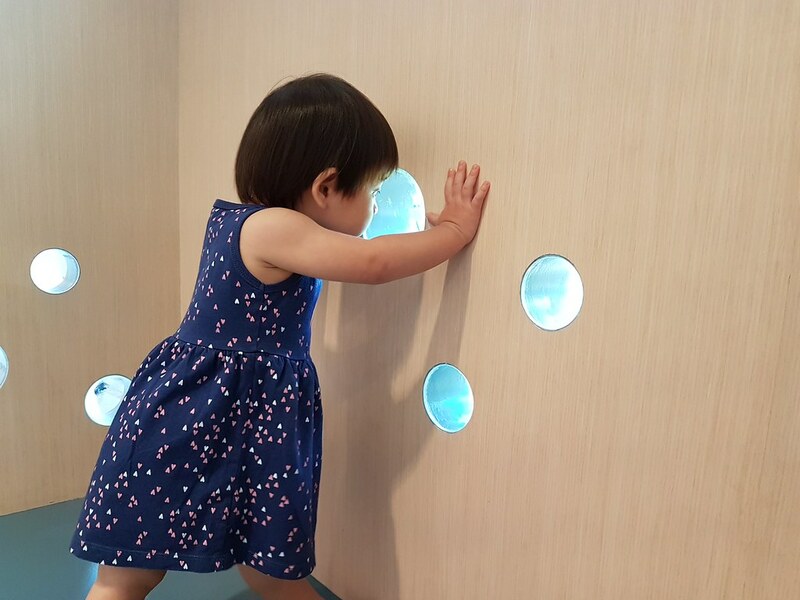 She hasn’t yet attended playgroup so this is the closest she gets to learning about being in a structured environment and socialising with peers. Also, musical experiences in childhood have been found to accelerate brain development and assist in increasing overall literacy. Dancing also helps them work on their motor skills and express themselves. I find her speaking skills rather limited at this time – her spoken vocabulary hasn’t exceeded 20 words and she chooses to babble to us in her own language with gestures. It’d be great if music helps her speak more. The food-related songs sung include Pancake Day and Rise, Sugar, Rise which apart from introducing actions like mixing, whisking, flipping (pancakes), rising, incorporate vocal techniques to familiarise them with music e.g. Pancake Day uses glissando, a continuous slide upwards or downwards between two notes. I can’t find the song here on YouTube due to strict copyright issues, so maybe you can enrol your kid for trial lessons to see if your child likes it. 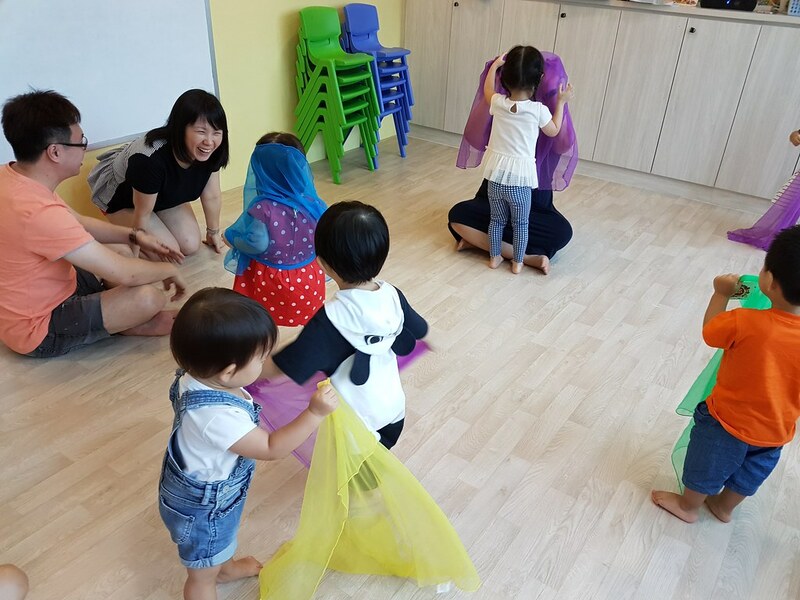 Near the end, there is about 3 minutes of quiet time where the room is darkened and soothing music is played for the toddlers to calm their mood down. Sometimes they lie down and rest, have a water break but other times they just roam around the room. 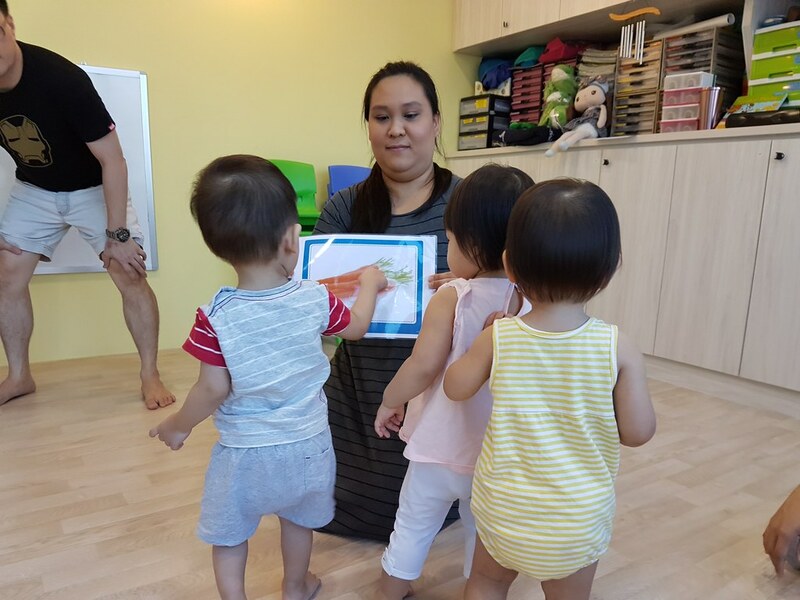 Teacher Natasha also recaps the activities covered during the lesson and their purpose for us to practise at home. 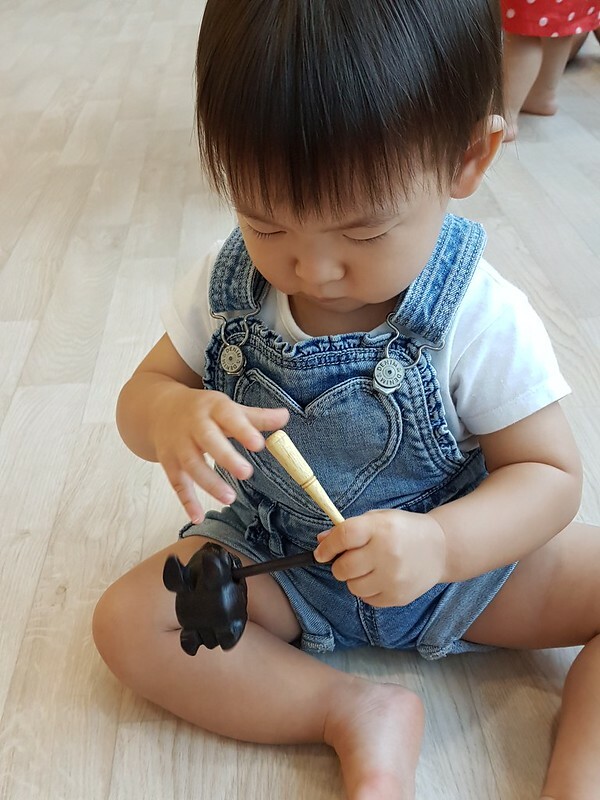 ** This is Part 2 of an ongoing review of Kindermusik, The Musical Voyage, brought to you by TodayGotClass and The Musical Voyage. Read Part 1 here. They are currently having a very attractive promotion of S$24 for 4 trial lessons! My friend told me that for Kindermusik, the teacher determines whether the class is interesting. Her kid attends classes conducted by a teacher with a voice “so amazing”, all the kids are enthralled. Once, they attended a make-up lesson by another instructor and she “almost fell asleep”. To be honest, I did feel a little worried. What if the class wasn’t up to my expectations? 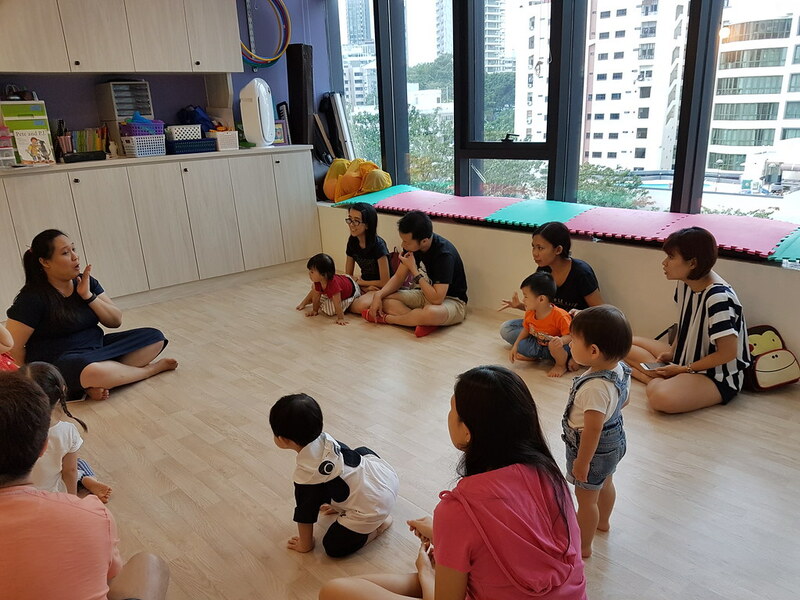 The class started promptly with Teacher Natasha introducing the children in the class. Then, we sat our kids on our laps and bounced them up on the sound of “Pop!” in “Pop! Goes the Weasel”. We also played with various patterns like bouncing the kids on our laps thrice before stopping. The children also held rattles which they shook and stopped on command. I was rather proud that Elise took the instructions well. This is meant to let the kids learn how to recognise rhythms. Elise was extremely shy at the beginning, choosing to stay in my lap. She has recently become more cautious of strangers, but when there’s music, there’s no stopping her. It took her a grand total of 10 minutes for her to warm up and transform from that shy kid at the back of the class to that annoying kid who runs right up to the teacher. Once she got into the mood, she bobbed and showed off her dance moves. As for Teacher Natasha’s voice? Infinitely better than me trying to sing at karaoke, and I’m not tone deaf. I cannot say the same about my husband though *hides*. She only sang for a short while but I’m sure we’ll be hearing her singing voice over the next few lessons. Out came a frog which played Peek-a-boo! This caught the attention of the young ones as they ran up to find the frog. One little girl shriekd “There it is!” when Teacher Natasha tried to hide it behind her, creating much laughter at her innocent remark. Elise has been watching Little Baby Bum on YouTube and there’s this Peek-a-boo song which she recognised when it was sang today. We were also introduced to this peculiar instrument in the shape of a frog. 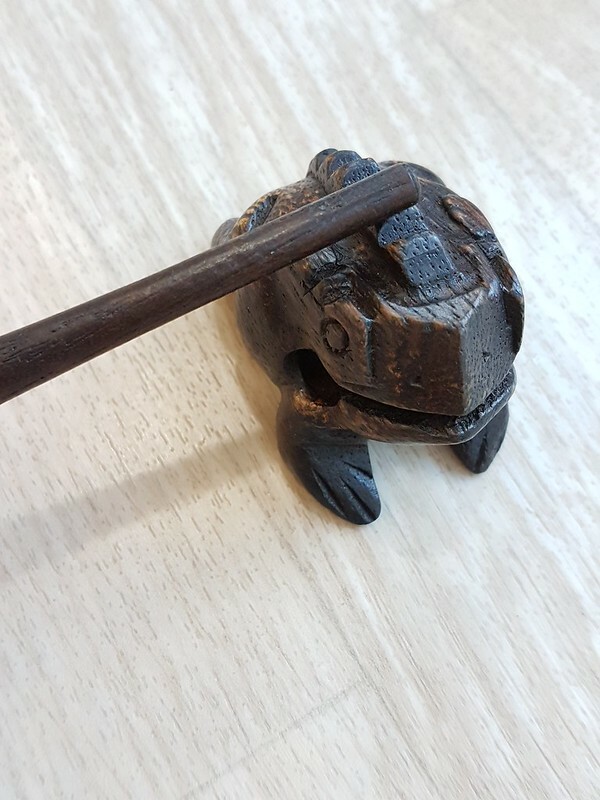 It was a croaking frog güiro, which amazingly made a very similar sound! Teacher Natasha informed us that our kids could be more interested in the holes at the side of the frog than making it croak. She guessed right, because Elise skewered that frog. She developed quite an attachment to that charred frog and was reluctant to return it back to the basket when the segment was over. They also tried to hop like rabbits. We were told that at this age, they haven’t quite mastered how to hop or jump. This was Elise’s best attempt at hopping. MORE peek-a-boo! By this time, the kids were warmed up and ran around freely with their scarves. Ehhh, how is it peek-a-boo if we can see each other even when the scarf is over your head? This theme was timely as we’ve been playing peek-a-boo with Elise frequently and she just started saying “Boo!”, albeit in an extremely unscary manner. Best picture of the day. The class lasted 45 minutes, which is less than our travel time (1 hour+ each way), but this face? Pure joy. 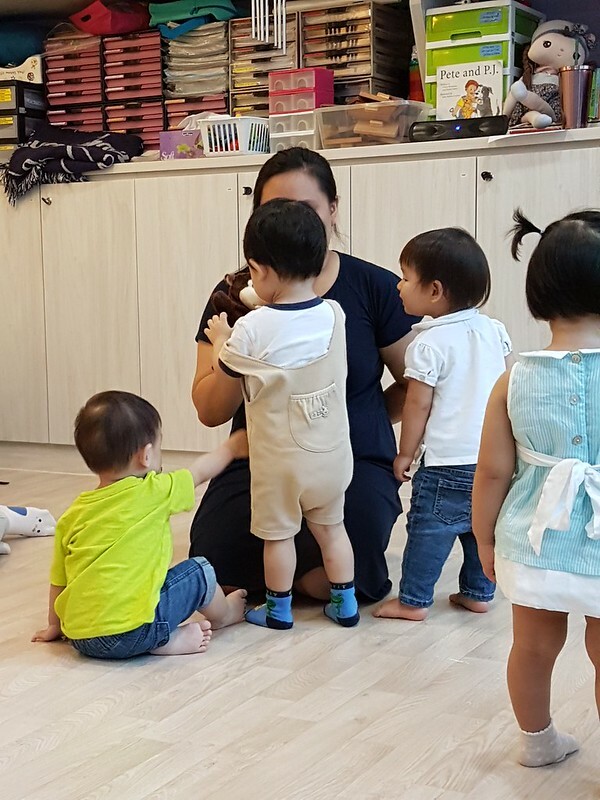 At the end of the lesson, she was so relaxed and comfortable, she ran up to another parent and tried to sit on her lap. 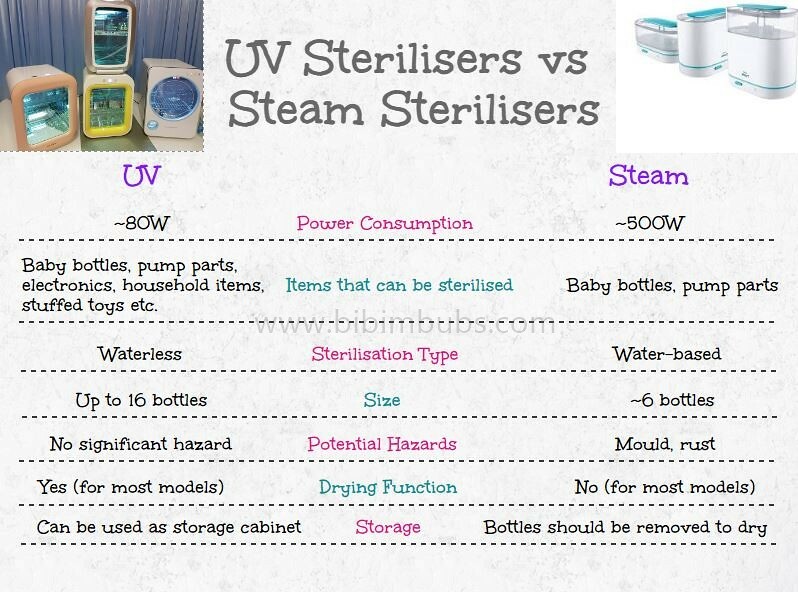 -_- Looking forward to next week’s lesson! 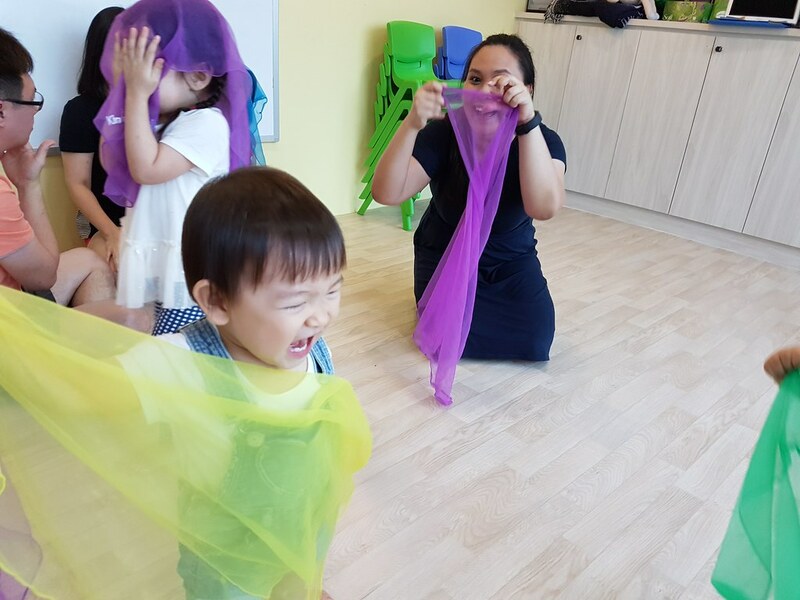 ** This is Part 1 of an ongoing review of Kindermusik, The Musical Voyage, brought to you by TodayGotClass. They are currently having a very attractive promotion of S$24 for 4 trial lessons!